Subject: 2018 Toys for Tots Donation Solicitation!!! I have taken over the 2018 Toys for Tots auction that we use to have. Longhorn has passed the torch, and I scooped it up to run with it! I am needing donations for the auction though. The donations can be anything from cigars, to t-shirts, lighters, cutters, ash trays, hats, cigar books, clothing, swag, etc. etc. etc.. Everyone has a box of random unused cigar smoking stuff don't they? Put it to use for the kids! It however should probably be geared towards cigar smokers, as the auction will be held for cigar smokers here on the site. Some of the new people may not have been around for the previous ones, so you can search the forums for previous Toys for Tots auctions and see how it was run. The difference between some of the previous ones and this one, is that you will keep your donation, instead of mailing it to me, and then I will combine donations, and set up "kits" to be auctioned off. Once the auction has been completed, and paid for by the winner, I will let the donator know to ship out their package to the person that won the auction kit that contained their package. This is my first year running this, so I am sure that I will screw something up along the way! Please have a little patience with me, and I will try to with you as well. We will make this a great donation for Toys for Tots as we always do! What do you have to donate for the kids? Do you want us to post it here or pm you? If you're going to combine items maybe a pm or email with a pic would work best. Also it would be good to have items for all price levels so we can get as many people participating as possible. you can shoot me a PM, or an email at duckslayer1021@yahoo.com Yes, I figured I'd have whoever donated, send me a pic of the items they were donating. I had planned on making some different levels of kits. That way everyone has a chance at one or 3, depending on how much they can spend. If someone doesn't win their package, or doesn't want to bid, they can also make a cash donation to TFT. As far as time frame goes, I'd like to get these donations squared away in the next couple of weeks if possible. Maybe this year maybe we can get a TFT Badge???? Just a thought. Come on guys! This is going to be an awefully boring auction this year if we don’t get some donations! 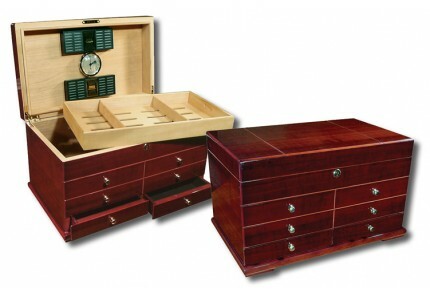 I will offer up this humidor (slightly used) with 50 cigars inside. I will also pay shipping*~! Cigars I will add to the humidor. All well aged~! Thanks Brad! Shoot me a PM with a pic of the cigars and the humidor if you don’t mind please sir when you get a chance. Hey Emerson. I'd like to offer up a box of the world famous, extremely limited edition, one and only year release of the Cigar Geeks by Reinado Cigars. A company not even in existence any more. Consider them well aged at over 3 years now and have been kept in perfect condition. These are a unique blend of a Nicaraguan Puro (Ligero and Viso filler) with a Habano Maduro binder and wrapper. The box comes with 10 cigars in a 6x38 Panatella size. Give me a little time to see what I can dig up E.
Thanks Paul and Kent! Keep them coming gentlemen! Sent a message to E with my donation pack. I got it Kent, thanks! Sent an email with pics of my donations. I will definitely donate some items. Not sure what yet, but I'm in brother! I got them Brian, and thanks Brian, looking forward to seeing what the donation will be! When I get home from this trip, I’ll start compiling a list of everything that hs been donated, and start putting the kits together. Keep them coming ladies and gents, this is looking good so far! Em, put me down for 20 cigars - you can use them as you need. I’ll send you pix and a list via your cell. I've got several items for the donation Em. I will take pics and send them to you this week.